As part of the National Sure Start Month Clive visited Cavidan Bargainer, a registered childminder in his constituency. He saw for himself the important role that home-based childminders play in the community. Numbers have increased markedly over the last few years. The number of registered childminders in the Borough has doubled since 2000 and there are now 188 registered childminders in Clive’s constituency. If you wish to use a registered childminder or if are interested in beoming a childminder then please click here. Clive attended the Memorial Hospital to officially start work on building works which will transform the services offered at the site. In all, the project will cost £15m and is being funded by the Treasury (not PFI). It was also highlighted as an “important strategic development” by Health Secretary Patricia Hewitt when she announced a £2bn capital investment programme for the NHS in February. Once the work is complete, it will provide much needed improvements to the infrastructure at these sites, improving the delivery of services and functionality of the hospital. Pictured right are: Clive unveiling a plaque to commemorate the start of the work; talking to Stephen Firn, Chief Executive of Oxleas Foundation Trust; and getting to sit in one of the diggers used on the site. 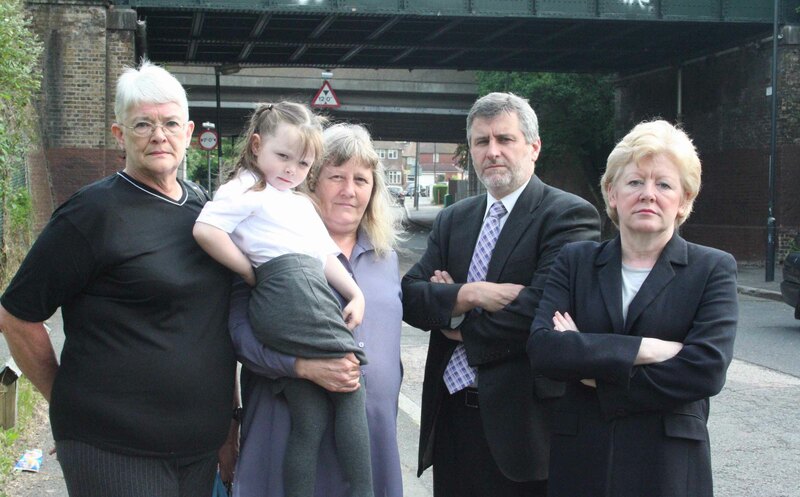 Network Rail has failed to replace damaged netting on a rail bridge in Birdbrook Road despite complaints from Clive Efford and local residents. The netting is supposed to prevent pigeons from roosting under the bridge and causing a nuisance by fouling the footpath below. However, the netting has become damaged and pigeons are getting through the net. Apart from fouling on the pavement, some pigeons become trapped in the netting and starve to death. The bodies are left to rot. The issue was first raised at one of Clive’s walkabouts on the Page Estate in November. Whilst Network Rail have repaired netting on other bridges locally, the one in Birdbrook has remained untouched. Clive will now refer the matter to the RSPCA as well as Network Rail. Clive Efford visited two local schools last week to collect cut-out teachers that were made by pupils to represent the real ones that they want the government to help provide for school children in Africa. The visits were organised in response to the Make Poverty History campaign that asked school children make paper cut outs of teachers. Clive went along to collect them and has promised to pass on the messages to Tony Blair and Gordon Brown. Clive was invited to Greenacres Primary School and The Newhaven Centre to talk to children about the campaign and answer their questions. Newhaven even gave Clive a full size paper teacher to deliver to Tony Blair. Clive will be delivering the cut out teachers to the Prime Minister in the near future.